Hi Helmar fans! This is Christine with you for one last post today! I have enjoyed spending the last six months blogging with you but am stepping away for now. Helmar has a fan for life in me, so I will never be far away! Some extremely talented folks will be joining you soon too! I have been playing a lot with burlap lately. Burlap is fun, full of gorgeous texture, and a pain to work with! Helmar's Fabric Glue helps make it a little easier! For this card I used the Helmar Fabric Glue in two places - on the back of the burlap to apply it to the card and to apply the doily piece to the card. The Fabric Glue dries quickly and made the job go a lot more smoothly. Applying a thin layer kept it from seeping thru the burlap and making a mess! Thank you for the months of fun Helmar! Today I'm going to share a simple way that you can make your own gusseted gift bags using Helmar's Craft and Hobby PVA Glue and a sheet of 12 x 12" patterened paper. Fold one side of your paper over so that it is about 1/2" past the center. Fold the opposite side over so that it overlaps the other side by about 1/2". Run a thin bead of Helmar Craft and Hobby PVA Glue along the inside of the top flap, spreading out evenly with your finger. Fold top flap over and press down. and press the corners down so that the center line is in line with the inner fold. Then fold one of the points so that the tip is about 1.75" past the inner fold, place a little glue on the tip to hold it in place. Next, fold the other point over in the same way, be sure to use enough glue to give a strong hold. Once this is done fold each side over so that the point on the bottom edge fills the point on the bottom of the bag. Now fold both of these sides back the other way. This will make it easier when inverting the sides. Place your hand inside the bag and softly push against the bottom, allowing it to take it's shape. Gently push the lower part of each side in, this will form the gusset. Once this is done, crease the outer edges of the sides while allowing the inner crease to go inwards. Fold over the top of the bag in the opposite direction of the back seam and decorate as desired. You can make smaller bags by using these instructions by starting out with a smaller sheet of paper. I hope you found this tutorial helpful and will give it a try next time you need a gift bag. 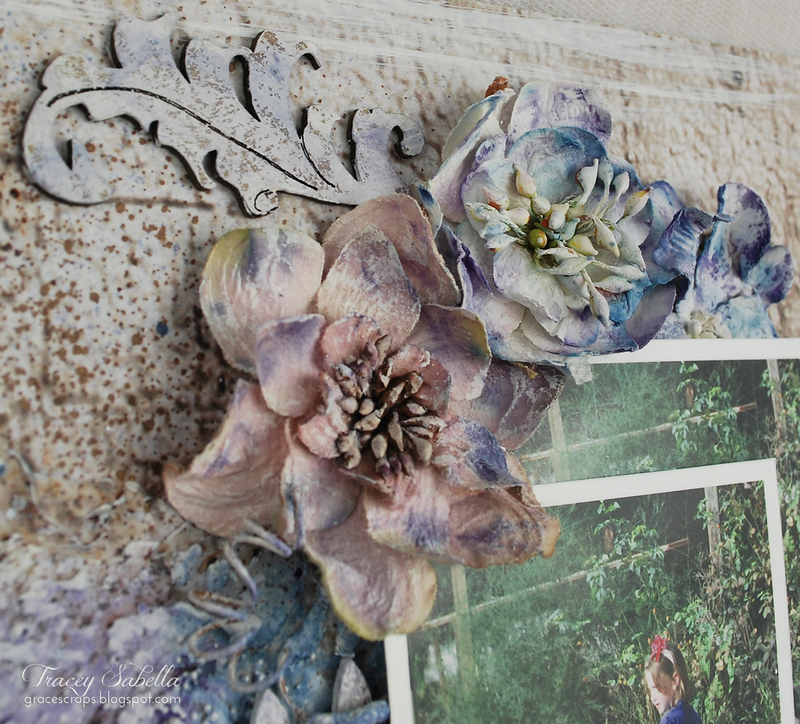 Hi everyone, Sandee here today to share with you a small shadow box mini album. 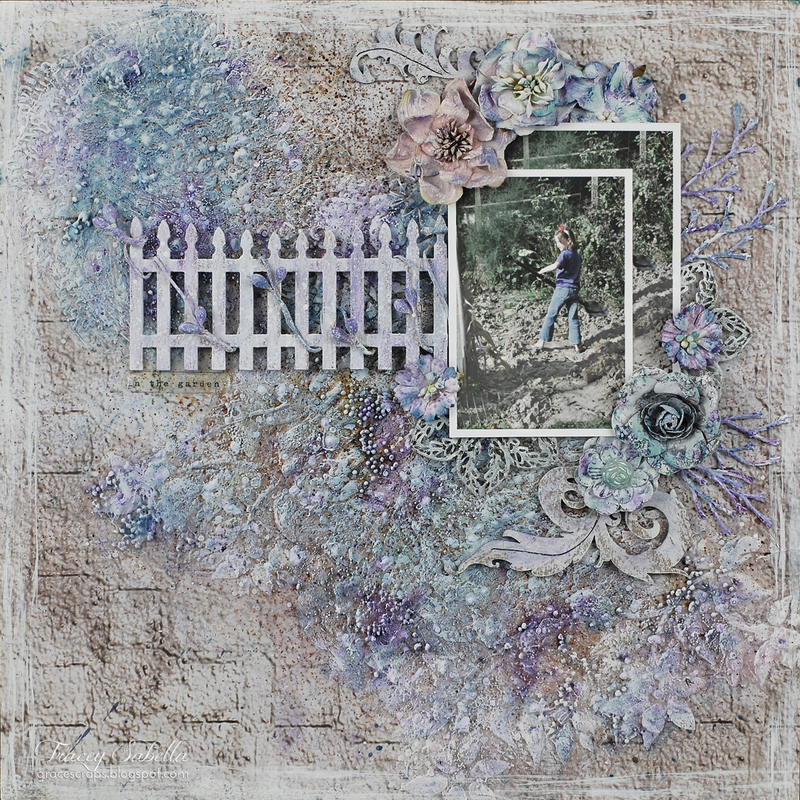 I saw one being created on the Prima U-Stream and just fell in love with using the shadow box as part of the album. Shadowboxes are great for commemorating anything you want by adding themed trinkets or memorabilia. When you open the album you can see the shadow box which is the base for the album itself. This is a great way to display 3 dimensional items without your mini album getting all wonky. Next pour a lot of glitter on top, you don't have to spread the glue out first, just pour the glitter over the top of it. Then use your finger to gently push the glue around the inside of the box to fill in the corners. Remove the extra glitter and simply press your embellishment into the area which embeds the piece, giving it a neat and finished appearance. I am also happy to report that you can drill through the thick layer of glue, It worked wonderfully when I needed to add the jump rings. Please note: I did let my glued areas set up for 4 days before trying this, do not attempt to do it when your glue is soft and not yet cured. I hope you get to try this technique out and create a little shadowbox mini album of your own. Butterflies are symbols of transformation through the process of metamorphosis. Butterflies are also symbolic of faith since its many transformations act as transitions in people's lives. March is a time when weather starts to change no matter where you are on this globe we call the world. Ava here looking forward to the change in weather and remember the butterflies will soon be presenting summer months for many of us. 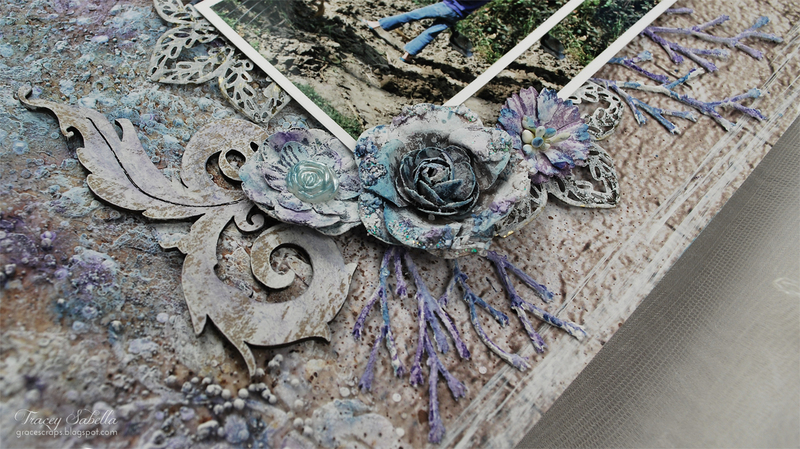 Helmar's 450 Quick Dry Adhesive worked perfectly for this delicant embellished layout. I also used Helmar's Acid Free Glue for the die cut embellishments. The Helmar 450 Quick Dry Adhesive allow's designers to hold the embellishments in place for a short time and the Adhesive sets the embellishments giving the butterflies the appearance of flight. Hi Helmar fans! Christine blogging with you today! I have four kids, so when I have the time to craft I have to make the most of it. Great adhesive enables that...and my tip for you today involves using the Quick Fix Adhesive Runner to make things quick and easy. Check out my St. Patrick's Day card, it does not look quick or easy...but I did it in less than 30 minutes! First I attached all the scraps to the back using the adhesive runner. I then set my wood stars on the adhesive runner and then pulled them off...it grabs some adhesive that way. Why make a project harder than it needs to be? Use great adhesive and that makes it all go smoothly! Printing images onto fabric has always been one of those things that I have avoided because I thought it was difficult and/or costly! Well to my utter joy and with the help of Helmar Spray Adhesive it is probably one of the simplest things I have ever done and the results are beautiful. To begin with, place your plain paper on a sheet of newspaper so that any overspray won't ruin your furniture. Shake the can of Helmar Spray Adhesive well and test spray on a scrap of paper. Once this is done you can spray your plain paper in an even sideways motion from a distance of about 20-25cm (8-10"). Allow 3-5 minutes for your glue to become tacky and then apply your fabric to the paper (right side up) smoothing out as you go. The paper backing may feel a little damp so give it a few minutes to dry out a little and while you are doing this you can fold a strip of sticky tape (or packaging tape) over the top end of your fabric paper piece, this will allow it to be fed into the printer straight and evenly. Be sure that there are no 'sticky' pieces or areas that will catch on the printer rollers. Print your image as you would any other image. Allow the image to dry before peeling off the sticky tape. and then peel off the paper from the back of your fabric. There you have it, a very easy way to print your images onto fabric without the need for expensive transfer papers!! I hope you enjoyed this little DIY and give it a try. Hi everyone, Sandee here with this sweet little fairy frame all decked out in her tulle and pearls. I don't know about you but I am ready for spring flowers and warmer weather! I began by layering acrylic paint onto a white frame with a foam paintbrush. 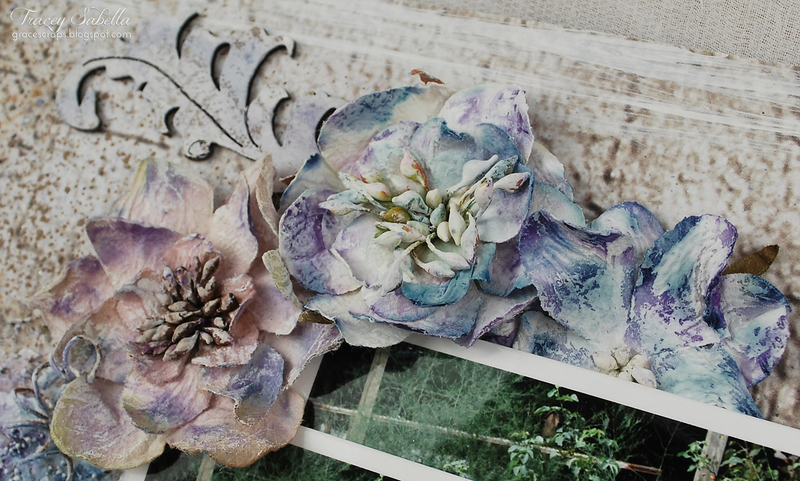 After it dried I then used my Helmar Decoupage and Craft Paste to adhere some tissue paper over the top to both soften the effect and to add some texture. Next I used Helmar 450 Quick dry Adhesive to secure the tulle around the edges of the picture opening. By adding a healthy dollap of Helmar Liquid Scrap Dots inside the flower petals I can achieve the look of a delicate butterfly dancing across the flower sipping nectar on a warm spring day.... OK, so nothing makes me wax-poetic like Helmar Liquid Scrap Dots!! Seriously, I love this product!! The final touches were adding the pearls to the butterflies and I took full advantage of Helmar's Gemstone Adhesive ability to not make your pearls and gems cloudy if you should happen to drop them in the glue...just saying', yes, I have done that!! Thank you so much for visiting us today, we appreciate each and everyone of you! It's Tracey here to share a layout featuring Helmar 450 Quick Dry Adhesive. Mixed media is a hot trend right now. 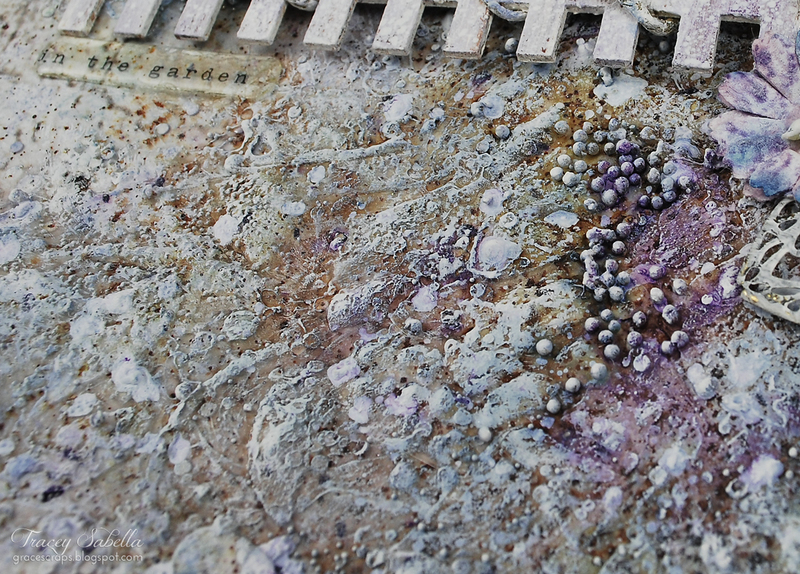 Adhering embellishments to mixed media surfaces, however, can be quite a challenge. I have found a solution with Helmar 450 which adheres well to these surfaces. My sweet niece is digging in her grandpa's garden. I pulled the purples and blues from her clothing to use for the page background and embellishments. 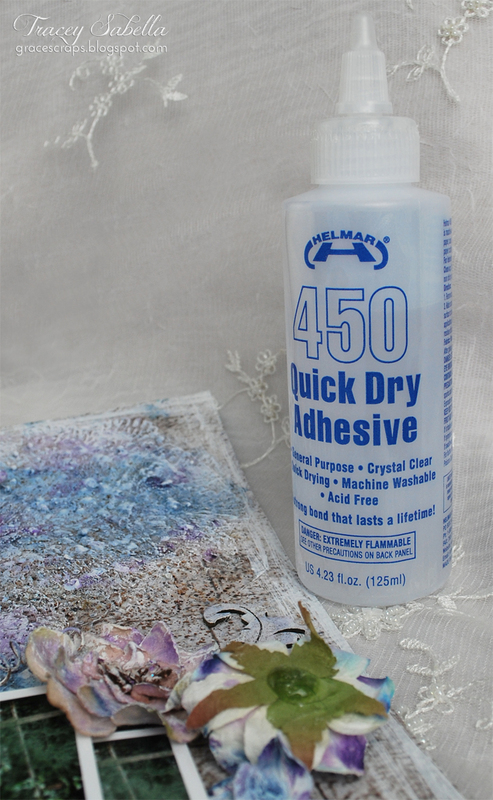 My embellishments and flowers are adhered with Helmar 450 Quick Dry Adhesive. The flowers are misted and gessoed. These twiggy stems started out bright glitter blue from a Christmas "pine" sprig. I painted them with spray gesso and then brushed with mist to color. The Leaky Shed Studio chipboard pieces are dry brushed with gesso, then with watered down mist. While most of my elements are adhered with 450 Quick Dry Adhesive, a couple of the flowers like this one on the left were adhered with Helmar Liquid Scrap Dots to raise up and position. Another view of the flowers. To tuck items in under the photos, I've raised them by adhering with Helmar Zapdots. 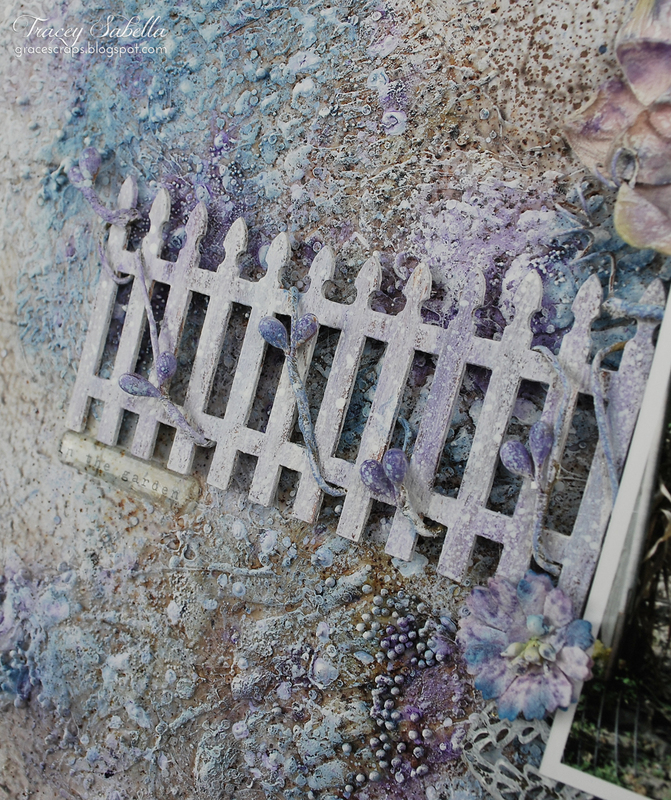 Another view of the fence and textured background. The "In the garden" title sticker just would not adhere to the background so I applied 450 Quick Dry Adhesive to adhere it as well. Finally, a view of the mixed media texture. I've stenciled with light molding paste, then brushed over with gel medium sprinkled with punch waste bits, micro beads and mini marbles. This was misted, gessoed, and splattered, and then dry brushed again with gesso. You can see why most adhesives would have a challenge adhering to this surface. Zapdots ~ White Square 1/2"